The CRAFTSMAN 305cc, 30” Dual Stage Snowblower is perfect for most urban consumers looking for a snow blower that has sufficient power to deal with most driveway snow conditions, yet is small enough to fit with everything else that is in your garage. With a 30 inch clearing width, consumers can clear their driveways and sidewalks in no time at all and blow the snow easily onto the front lawn or into the snow bank. The 305 cc engine is winter ready and has lots of power for the 30 inch wide, 12 inch steel saw tooth auger and 12 inch impeller. As with most snow throwers of this size the CRAFTSMAN 305cc, 30” Dual Stage Snowblower is a dual stage blower which mean it uses an auger to draw the snow in and an impeller to actually then blow the snow out the chute. An electric starter, a steel rotation chute with crank complete the features on this snow blower machine. This snow blower is really ideal for the average consumer. With enough power and snow throwing capacity for most urban driveways , yet small enough to easily store in a corner of the garage, it will be a handy tool in the middle of the winter. Add a snow a snow shield if you are concerned about strong winds or blowing snow while you are clearing your driveway. 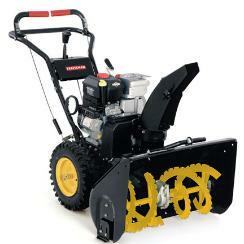 Although this snow blower does not come with tire chains, the knobby tires will handle most situations with no problems. You might need chains for sloping driveways that ice over during the winter. This Craftsman snow blower can be started using the traditional pull rope to start it or you can plug in the starter and start the engine with the push of a button. Either way a well tuned engine will start on the first crank of the engine. The chute can be rotated 180 degrees with the use of hand crank. It is a bit difficult, but you can steer and crank at the same time. Depress both handles on the hand bar and then using one hand to hold the controls in place, crank the chute in the direction desired. Delivery: Delivery of the CRAFTSMAN 305cc, 30” Dual Stage Snowblower can be arranged through the dealer that you purchase the machine from. There will be a delivery charge, however this is probably the most economical method unless you have access to a van or a small trailer that you can transport the snow blower on. 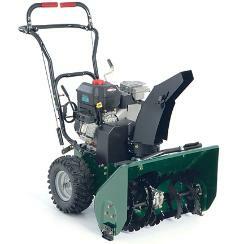 Online Reviews: We were unable to find any online reviews for the CRAFTSMAN 305cc, 30” Dual Stage Snowblower, however please leave your comments at the end of this blog if you have used one of these machines. Prior to starting the CRAFTSMAN 305cc, 30” Dual Stage Snowblower the first time each day, perform a quick walk around check of the machine to ensure there are no loose parts and no leaking fluids. Check the engine oil to ensure that it is at the correct level as specified by the manual. Top up if necessary. Fill the fuel tank while the engine is cold and prior to using the machine. If you do spill fuel, wait until it has fully evaporated prior to starting the engine. Never spill fuel on a hot engine to avoid fires. Always fill the fuel tank outdoors to avoid any possibility of vapors going into your house. The Craftsman 208cc 24inch Dual Stage Snowblower has a powerful 208 cc PowerMore OHV engine to provide that extra power you need to go through the deepest drifts of snow and ice. Twelve inch augers with a 12 inch impeller provides a dual stage snow clearing with lots of snow clearing capability and the 24 inch wide clearing width will make short work of most driveways in urban American and Canada. Operators can control the snow blower with one hand from either while at the same time managing the direction of the chute so that snow can be thrown in what ever direction is needed to avoid hitting buildings, windows or cars. The arctic polymer chute will not crack and will not rust and will withstand the rigor of dealing with snow an ice. Never point the chute in the direction of another person to avoid any possibility of them being hit with ice chips. 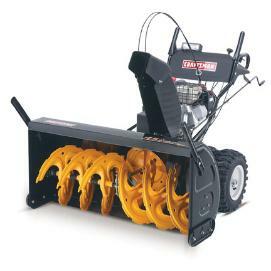 Transmission: Dual stage operation is designed for quick, easy removal of a large amount of snow. Dual stage operation is designed for quick, easy removal of a large amount of snow. Single hand control allows you to control unit from either side by using one handle, enabling you to operate the chute with one single action & without having to stop. This snow blower comes with a crank to turn the chute in a 180 degree direction. There is also an electric starter to start the engine. The 15 inch tires provide lots of traction even in icy conditions. Add optional chains if you have to deal with lots of ice. Consumers can also purchase an optional cover if they need to store their snow blower outside in the elements. At the time of preparing this post, Craftsman had added a screen for customers to leave comments and review ratings. This model had two very positive reviews extolling the virtues of this snow blower. Delivery: Delivery of the Craftsman 208cc 24inch Dual Stage Snowblower can be arranged through the dealer that you purchase the machine from. There will be a delivery charge, however this is probably the most economical method unless you have access to a van or a small trailer that you can transport the snow blower on. Online Reviews: We were unable to find any online reviews for the Craftsman 208cc 24inch Dual Stage Snowblower, however please leave your comments at the end of this blog if you have used one of these machines. Prior to starting the Craftsman 208cc 24inch Dual Stage Snowblower the first time each day, perform a quick walk around check of the machine. Ensure there are no loose parts and no leaking fluids. Check the engine oil to ensure that it is at the correct level as specified by the manual. Top up if necessary. Fill the fuel tank while the engine is cold and prior to using the machine. If you do spill fuel, wait until it has fully evaporated prior to starting the engine. Never spill fuel on a hot engine to avoid fires. Always fill the fuel tank outdoors to avoid any possibility of vapors going into your house. Like all snow blowers or snow throwers, maintenance is important for your machine to operate at a peak level for many years. Change the engine oil regularly. Check the belts for tightness. Change the spark plug as required. Grease any spots outlined in the manual. If you need to leave the snow blower outside all year round, cover the machine with a proper cover. The cover will help to keep it looking new and avoid deterioration of the tires and metal components. The Craftsman 179cc 22 inch dual stage snowblower comes with a 179 cc PowerMore OHV engine providing lots of power for the dual stage 22 inch clearing width. This snow blower is a low end snow blower both in terms of features as well as price and will meet all of the needs of most suburban residents who want to clear their driveways and possibly the sidewalk in front of their homes. If you have larger areas or get lots of snow , you may want to consider a larger machine, however this snow blower will more than meet your needs for the majority of consumers. The 9 inch steel serrated auger cuts into the snow and pulverizes it before pushing it into the impellar which throws the snow out the polymer chute. Consumers can also use the electric starter to start the engine in cold conditions or if you just do not have the strength to pull the back up starter chord. Operators can rotate the chute 180 degrees and aim the chute to either side or straight forward depending on conditions and also on objects near were you are blowing snow. The polymer chute will not rust or crack in the cold weather. Note that it does not have a crank to rotate the chute, instead it has a handle that you can use to rotate the chute to the desired direction. Consumers can also purchase a snow shield to protect you from the wind and blowing snow as an accessory. This can be quite useful if you live in an area that has a lot of wind or if you find that the snow you are removing is consistently being blown by the wind back at you. This is a relatively small snow blower that will fit into most garages beside the family car. At 22 inches it is one of the smaller snow blowers. However if you need to store it outside during the winter and off season, purchasing a protective cover is always a good idea to protect it from the elements and from UV rays. Delivery of the Craftsman 179cc 22inch Dual Stage Snowblower can be arranged through the dealer that you purchase the machine from. There will be a delivery charge, however this is probably the most economical method unless you have access to a van or a small trailer that you can transport the snow blower on. Online Reviews: We were unable to find any online reviews for the Craftsman 179cc 22inch Dual Stage Snowblower, however please leave your comments at the end of this blog if you have used one of these machines. Prior to starting the Craftsman 179cc 22inch Dual Stage Snowblower the first time each day, perform a quick walk around check of the machine to ensure there are no loose parts and no leaking fluids. Check the engine oil to ensure that it is at the correct level as specified by the manual. Top up if necessary. Fill the fuel tank while the engine is cold and prior to using the machine. If you do spill fuel, wait until it has fully evaporated prior to starting the engine. Never spill fuel on a hot engine to avoid fires. Always fill the fuel tank outdoors to avoid any possibility of vapors going into your house. Finally never point the chute in the direction of people, buildings or cars to avoid any possible damage and accidents. Sometimes chunks of ice can be thrown at high speed from the chute. If they hit something or someone, it can cause a lot of damage. Like all snow blowers or snow throwers, maintenance is important. Maintain your machine to operate at a peak level for many years. Change the engine oil regularly. Check the belts for tightness and change the spark plug as required. Grease any spots outlined in the manual. If you need to leave the snow blower outside all year round, cover the machine with a proper cover. This will keep it looking new and avoid deterioration of the tires and metal components. For more Craftsman reviews, click here. The CRAFTSMAN 342cc, 45” Dual Stage Snowblower comes with a 342 CC Briggs and Stratton engine, designed for cold snowy conditions. 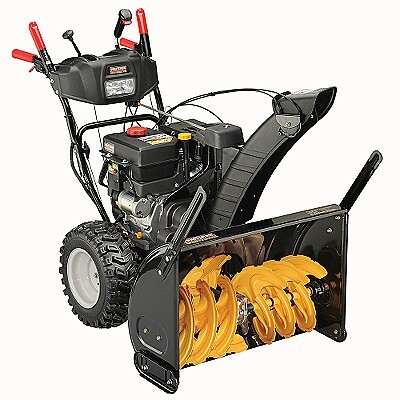 It supports a 45 inch snow clearing width with lots of power to blow the snow well away from the area you are clearing. The twin 16 inch augers and 16 inch impeller can handle even the largest drifts that you throw at it. The tires are 16 inches wide by 6.5 inches high. This is a dual stage operation snow blower i.e. the augers first break down the snow and pull it into the towards the impeller which then actually throws the snow out the chute. With the 45 inch wide clearing width, you can clear a large driveway in no time at all or a small parking lot. It also features a power steering feature that allows you to keep one hand on the steering mechanism and one hand can be used to change the direction of the chute to direct the snow away from the house, parked cars or other objects that you wish to avoid. The CRAFTSMAN® 342cc, 45” Dual Stage Snowblower also comes with a standard 2 year warranty. There is also an electric starter to start the engine and avoid having to use the backup pull chord. The headlights will also assist you in clearing snow at night in areas where there are not street lights or other natural light situations. Arctic Polymar chute, crank chute, remote chute deflection control allows operator to adjust the angle of the chute deflector without having to stop the unit. This snow blower comes with a number of features that many consumers will find useful. Especially when they are clearing snow from walkways and driveways. The electric starter for example makes it easy to start on cold winter mornings. The yard lights will light your way in the evening and early morning hours. And the drift cutters will help to cut through drifts that are higher than the snow blowers opening. One special feature which many people will find useful is the power steering capability. It provides for single hand control of the snow blower. Operators can use their other hand to adjust the chute from side to side as well as the angle of the chute, while still controlling and steering the snow blower. Delivery: Delivery of the CRAFTSMAN® 342cc, 45” Dual Stage Snowblower can be arranged through the dealer that you purchase the machine from. There will be a delivery charge, however this is probably the most economical method unless you have access to a van or a small trailer that you can transport the snow blower on. 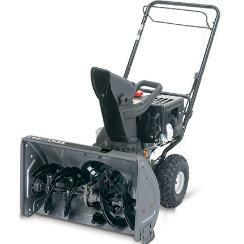 Online Reviews: We were unable to find any online reviews for the CRAFTSMAN® 342cc, 45” Dual Stage Snowblower, however please leave your comments at the end of this blog if you have used one of these machines. Prior to starting the CRAFTSMAN® 342cc, 45” Dual Stage Snowblower the first time each day, perform a quick walk around check of the machine to ensure there are no loose parts and no leaking fluids. Check the engine oil to ensure that it is at the correct level as specified by the manual. Top up if necessary. Fill the fuel tank while the engine is cold and prior to using the machine. If you do spill fuel, wait until it has fully evaporated prior to starting the engine. Never spill fuel on a hot engine to avoid fires and always fill the fuel tank outdoors to avoid any possibility of vapors going into your house. Like all snow blowers or snow throwers, maintenance is important for your machine to operate at a peak level for many years. Change the engine oil regularly. Check the belts for tightness. Change the spark plug as required and grease any spots outlined in the manual. If you need to leave the snow blower outside all year round, cover the machine with a proper cover. This will keep it looking new and avoid deterioration of the tires and metal components. The Craftsman 357 Snow Blower has a 30 inch clearing width and a 21 inch height capability, to clear lots of snow from driveways and walkways. 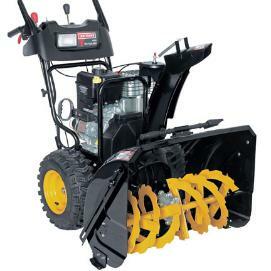 It also comes with drift cutters to cut through snow drifts and hard packed snow. The tires are 16 inch x-trac tires, there are headlights and it comes with a 5 quart fuel capacity. Most sears stores will deliver the Craftsman 357 Snow Blower or any other snow blower you may purchase for a nominal fee. If you do not have a trailer available, they you will definitely need to make arrangements for delivery of your snow blower. Customers can also order the Craftsman 357 Snow Blower on line and shipping and delivery charges can be included. At the time of writing there were 11 reviews giving a rating of 4 stars out of 5 stars for this model. All ratings except one were positive for the Craftsman 357 Snow Blower. Glowing remarks covering all aspects were provided by new owners of this snow blower. The one exception was difficult to read. Not sure if this was intentional or not. From what we could make out, oil was dripping from the gearbox and the customer obviously was quite dissatisfied. Unfortunately we could not read any more details, so we have to assume that someone did not assemble the snow blower properly and oil began leaking out after it was delivered. One customer found he had to realign the belts before the snow blower would operate properly. He as the type that was comfortable doing this sort of thing and was able to fix it himself. The alternative would have been to load up the machine onto a trailer and return it for repair which is an obvious negative. General maintenance of any snow blower including the Craftsman 357 Snow Blower is pretty straightforward. Check the oil level prior to every use just to make sure there has been no leakage while sitting and also that the engine has not burned any oil. With new engines this usually not a problem, however after a few seasons depending on useage and care, the engine oil level could decline and operators should always monitor the oil level prior to every use. Sheer bolts should be checked after every use to ensure they are tight and secure. Spark plugs should also be changed after 100 hours of use or after every season. Always clean and dry the unit after every use prior to storage. The combination of humidity and salt in the snow, especially salt near the road pushed in by snow plow can over time cause rust and deterioration. Seasonal maintenance of the Craftsman 357 Snow Blower should always be completed which includes changing the oil, make sure all bolts are tight, spark plug should be replaced, tire pressure checked and corrected if necessary and the snow blower should be thoroughly cleaned and dried. As with all snow blowers, the Craftsman 357 Snow Blower is pretty straightforward to operate and maintain. Customers should follow the recommended maintenance guidelines and if you do the snow blower will last for many years. From a safety perspective, always shut the snow blower off. Also disconnect the spark plug wire prior to performing any maintenance around the auger or the engine. This may seem a trivial thing to do. However too many hands and arms have been damaged by careless accidents. With people are trying to clear an ice jam from the auger only to have their hands cut off by a running machine. In addition, following the step by step process for changing the oil and spark plugs can be quite easy to do. Dispose of the used oil properly and clean and dry the housing. Properly maintained snow blowers will last for years. If you are not comfortable doing this work yourself, then you should call your local small engine mechanic to see what they would charge for this annual maintenance service. Also it is a good idea to get to know the local small engine mechanic. Most will give you lots of advice regarding maintenance and repairs for your snow blower and other house hold engines. 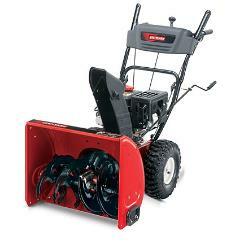 For more information about Craftsman Snowblowers, click here.